Drafts saved to local storage. Handlebars for templates and logic. 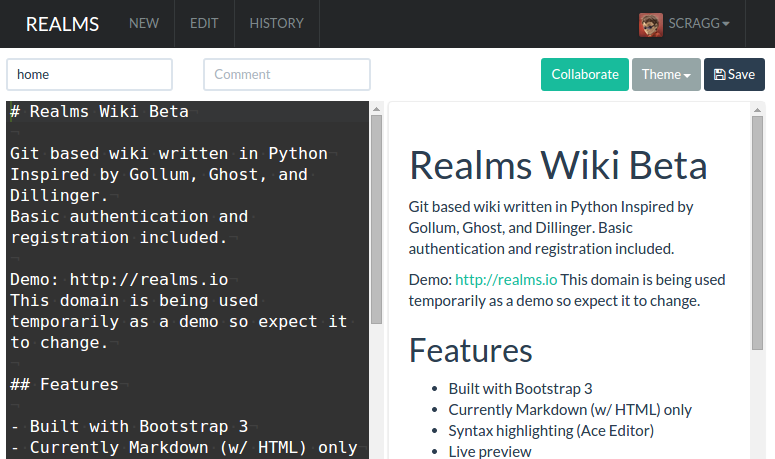 In my limited trial, Realms seems less useful than Gollum for my particular use-case (i.e., you're limited to markdown syntax only), but other users may enjoy the basic user authentication and registration features, which Gollum lacks. Also of note is that the docker image is 1.17GB in size, and the handful of commits to the source GitHub repo in the past year has listed TravisCI build failures. This has many of the hallmarks of an abandoned project, to my mind. Setup unique static subnets for every stack you deploy. This avoids IP/gateway conflicts which can otherwise occur when you're creating/removing stacks a lot. See my list here. If you wanted to expose the Realms UI directly, you could remove the oauth2_proxy from the design, and move the traefik_public-related labels directly to the realms container. You'd also need to add the traefik_public network to the realms container. The inclusion of Realms was due to the efforts of @gkoerk in our Discord server. Thanks gkoerk!